sql-server-2012,ssas,ssas-tabular , Do I need to import the full data in SSAS tabular mode from my SQL database in DirectQuery mode? Do I need to import the full data in SSAS tabular mode from my SQL database in DirectQuery mode? I'm trying to build a Analysis service tabular project in tabular mode and want to use DirectQuery mode so that the queries are executed at the backend. When I click on the model, and select import data from source, I see option to retrieve the full data. Now I have a billion rows in my fact table and I dont want to import the entire data when building the model. Am I missing something here? DirectQuery in tabular , from what I understand, is similar to ROLAP storage mode in Multi Dimensional world, where there is no need for the process step and queries get real time data. So what's the point of importing all the data when building the model? If it is just to get the schema of the tables, why not just query the DB for schema of tables instead of importing the full data? Can someone explain? 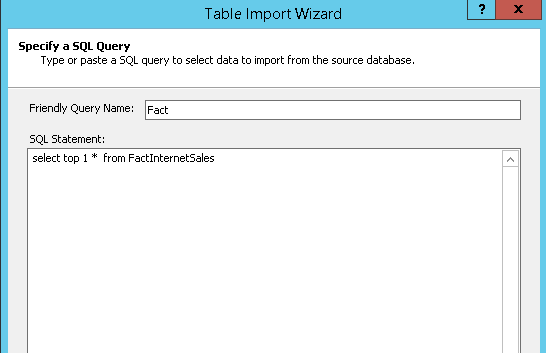 When you go through the Import From Data Source wizard, select Write a query that will specify the data to import. Write a query that imports only one row, SELECT TOP 1 * FROM <table_name>. That will import just one row and the schema. How to reference SQL snippet multiple times in a query? How to go backwards through the previous 12 months? Where to declare a SET in SQL?